from receipt to balance sheet. Enter expenses in seconds, approve anywhere and export directly to accounting or bill pay systems for accurate reimbursement and reconciliation – without having to be an accounting expert. Best of all, you can set it up yourself! Expense report software built for you. Stop shoving receipts in your wallet after jotting down notes of clients or attendees. With Tallie, simply snap receipt images with your phone and let the system populate your expense report for you. Put an end to the monthly "what was this expense for?" conversation with the company bookkeeper. Tallie pulls credit card transactions into an expense report matching your statement and merges receipts in advance of your review. Relieve yourself of the headache of receipt management and manual expense report processing. Ensure employees are reimbursed on time, track where your company spends its money, and ensure all expense is properly booked into your accounting and bill pay systems. "We chose Tallie as a key App Center partner for its innovative approach to the expense report nightmare, deep partner integration, and dedication to the best customer experience." Try Tallie for 14 days at no cost to you. No obligation. No credit card required. Our clients report an average of 67% time savings over traditional spreadsheet expense reports. Give Tallie a test-drive and calculate the benefits to your company. 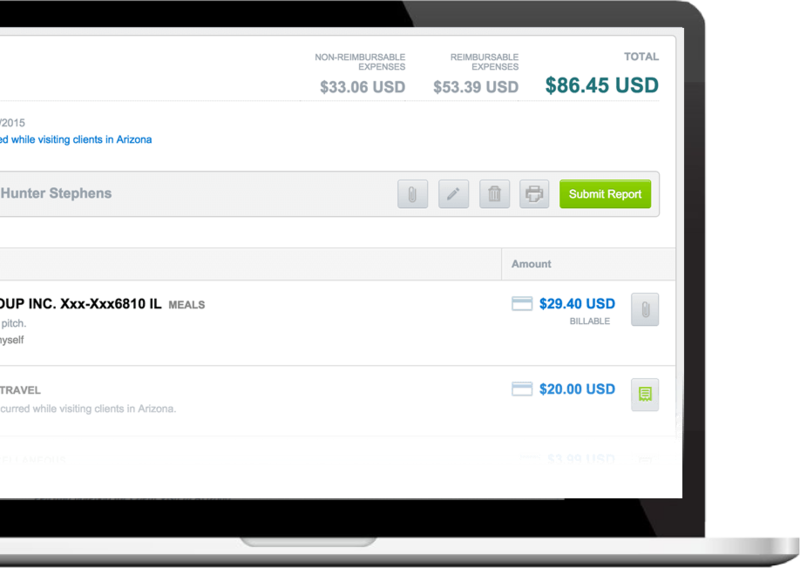 Tallie expense report software simplifies the entire expense management process. From point of purchase to accounting and reimbursement, Tallie eliminates busy work using real-time integration with leading accounting and bill pay solutions including QuickBooks Online, QuickBooks Desktop, Xero, Sage Intacct, Oracle NetSuite, and Bill.com. We are preparing your account and will send you a verification email shortly. I accept the Tallie Terms of Service. Please contact me for a product demo. Whoops! It looks like you've already created a Tallie account using this email address. If you have any questions, contact Tallie Support or give us a call at +1-888-874-1118. A Tallie Expert will be in touch with you shortly.